Diplomatico Rum also known as Ron Diplomatico is a rum distillery in Venezuela founded in 1959 by Don Juancho in the Planas Valley. There, surrounded by the sugar cane fields, it is still situated today whilst exporting to over 100 countries. 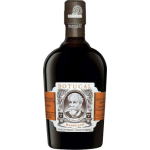 The Diplomatico Mantuano Rum is a brown rum from Venezuela by Ron Diplomatico. This rum is ..